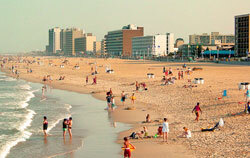 There are several Virginia Beach cruises to choose from. Take a beautiful dinner cruise or hop on a fun pirate cruise along the oceanfront. Are you a nature lover? Then take a dolphin-watching cruise or a whale watching cruise from Virginia Beach. Rudee Tours runs daily dophin watching and sunet cruises from Memorial Day to Labor Day. They're also the operators of the Rudee Rocket high speed boat thrill ride. During the winter months, they offer whale watching cruises. 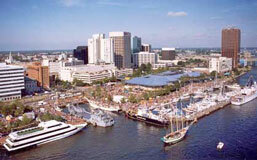 The Virginia Aquarium & Marine Science Center offers Virginia Beach whale watching cruises and dolphin watching cruises. Get up close and personal with the big guys. Knowledgeable staff answer questions. If you're planning a large group outing or special event, the Carrie B is available for private charters. The Carrie B is a paddle wheel style showboat. There are additonal options in nearby Norfolk, where the harbor cruise options include Spirit of Norfolk dinner cruises, Victory Rover Naval Base tours, and American Rover tall ship cruises. If you like these smaller ship cruises, maybe you'd also enjoy one of Carnival Cruise Line's cruises to the Bahamas from Norfolk.